i-BJF-SupResLines indicator draws support and resistance lines on the chart. Support levels located below the market. Resistance levels located above the market. You can use the indicator on 4-digit accounts and 5-digit accounts. Support and resistance levels match significant tops. Essentially every significant top is extended fractal with 2 periods: amount of bars prior the top and amount of bars after the top. Indicator has the option (BarsBack) how many bars in the history process for search. 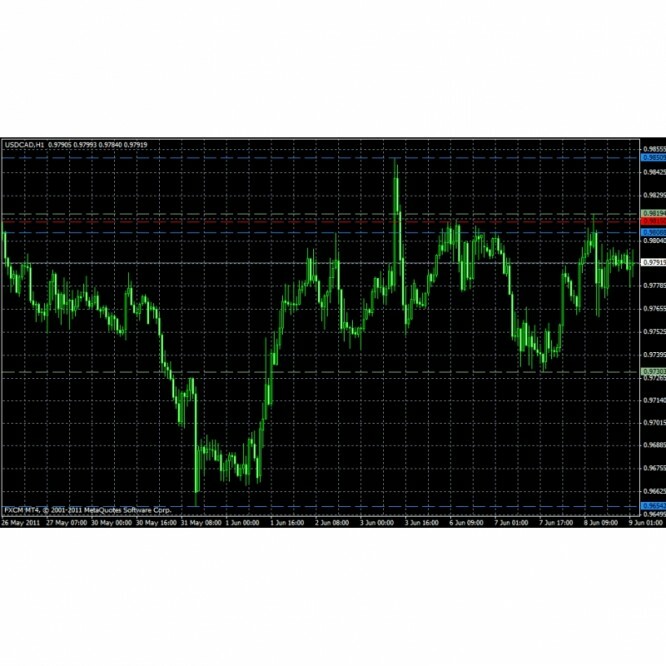 You can add verical offset (SupRes.VShiftPips option) for support and resistance levels. Attached on the chart the indicator checks the current timeframe and higher timeframes to detect and draw support and resistance levels. You can set on/off for every timeframe. Every timeframe has unique color, line style and line width options. There are 2 versions of the indicator: standard and with alerts.The version with alerts triggers popup, email and sound alerts on the cross of support or resistance line by the market. extern int SupRes.VShiftPips = 0; // you can add verical offset (pips) for support and resistance levels. We have added rectangles instead of trendlines. Now you can expand Support or Resistance lines to Support or Resistance zones.